There is currently a strong focus across global commodity markets on the European debt crisis as a key driver of price movements. This is unsurprising given the consequences of a eurozone breakup on commodity markets are likely to be very profound indeed. But while Europe is grabbing the headlines, there is growing evidence of a material slowdown in Chinese economic growth. Marginal demand growth from China is a key factor driving the evolution of all commodity markets, but no more so than the coal market, given China is by far the world’s largest consumer. The miracle of Chinese growth? We have focused previously on weakness in Chinese industrial output and published data has deteriorated further over the last few months. 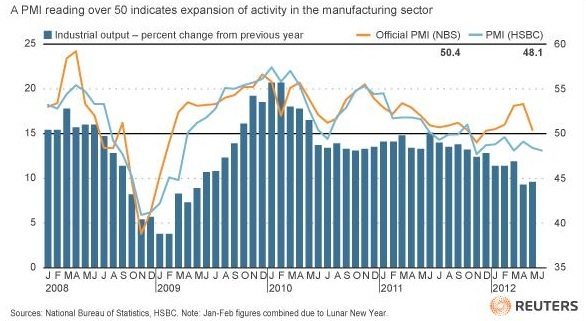 According to the HSBC Purchasing Managers Index (PMI), the manufacturing sector in China has been contracting for 7 months now as shown in Chart 1. After a divergence earlier in the year, China’s official PMI (of dubious accuracy) has been rapidly catching up over the last 2 months. 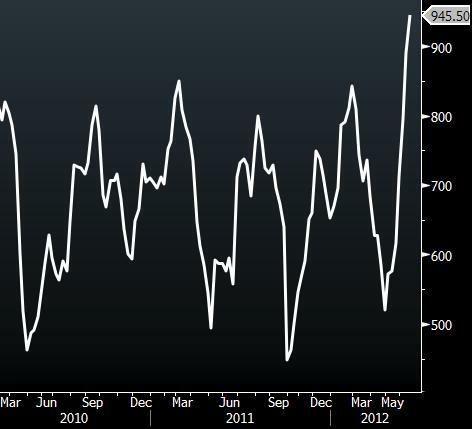 The chart also shows a clearly declining trend in the growth of Chinese industrial output. There has been a consensus of faith across global markets that Chinese central planning will be able to maintain economic growth rates at 8-10% indefinitely. 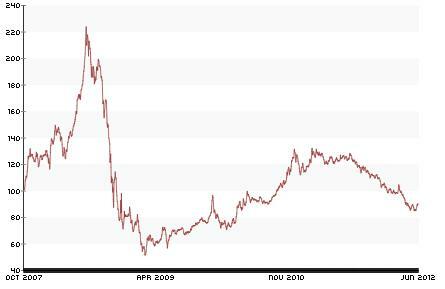 It was after all China’s growth management through its massive stimulus program that revived the global economy in 2009 after the collapse of Lehmans. But this view fails to recognise the headwinds that policy makers in China are currently facing. The reality is that a significant part of China’s growth since 2007-08 has been an illusion. Its headline growth of 8-10 per cent since then has been driven by new lending averaging 30-40 per cent of GDP. Up to 20-25 per cent of these loans may prove to be non-performing, amounting to losses of 6-10 per cent of GDP. If these losses are deducted, Chinese growth is much lower. China accounts for a staggering 47% of global coal consumption. A substantial portion of China’s marginal coal demand growth has been to fuel the rapid expansion in power generation capacity to support industrial growth. There is increasing evidence that the recent weakness in manufacturing is flowing through into a fall in demand for power and the coal required to generate it. The ‘canary in the coal mine’ is China’s coal inventory levels. Qinhuangdao is the world’s largest coal loading port handling half of China’s coal requirement, around 200 mT of coal a year. Chart 2 shows that the build up in inventory levels at the port is now at all time high and approaching maximum capacity. Aside from physical constraints, the port managers are apparently concerned that the growing stockpile may start to spontaneously combust. The impact of the deterioration in Chinese manufacturing growth and rising inventory levels can clearly be seen in this year’s falling Amsterdam-Rotterdam-Antwerp (ARA) European delivered coal price. 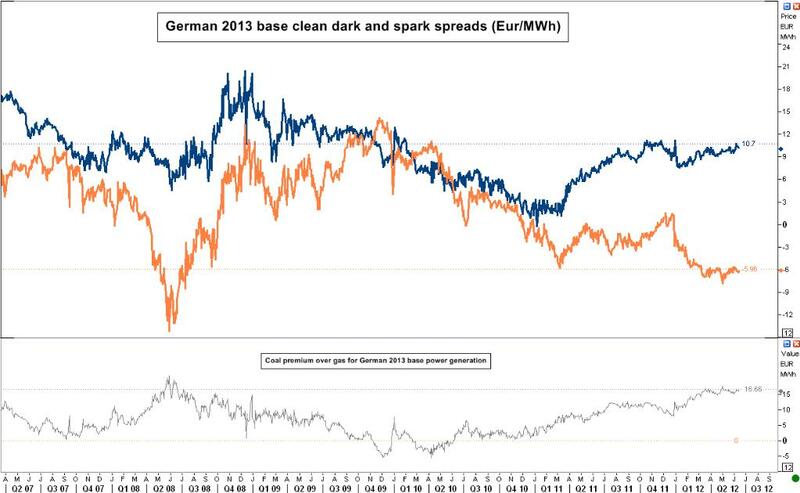 Softening coal prices (along with continuing weakness in the carbon market) have continued to support coal generation margins (clean dark spreads) across Europe. At the same time gas prices have held up relatively well driven by robust Asian LNG demand. Chart 4 shows the resulting divergence in the relative competitiveness of gas vs coal fired generation. The eurozone crisis, a strengthening dollar and a continuing decline in Chinese growth will likely maintain downward pressure on global coal prices. In turn, this should continue to support coal fired generation margins across Europe and prolong the pain being suffered by gas fired generators.